Now available: How To See: Tokyo & Street Photography! For your holiday viewing pleasure…I’m pleased to offer up the next two instalments in the workshop video series: How To See Ep2: Tokyo, and Street Photography Ep1. Travel vicariously into the photographic wonderland that is Tokyo. Building on Episode 1 filmed in Kuala Lumpur, we travel to Tokyo with a completely different equipment loadout with the intention of making unique images of a place that is no stranger to being photographed. Once again, I explain what’s catching my attention in a particular location, and why I chose that particular framing and processing. I explain afterwards why a particular image works – or doesn’t. This video is unique in that all of the segments are filmed in one take: we can’t reset the scene and try again. What you’re seeing is really and exactly what I was seeing at the time of shooting. Episode 3, 4 and 5 will be filmed in Melbourne, Havana and London respectively throughout 2014. This video explains and demonstrates the fundamental techniques and tricks required to create a strong street photograph: one that highlights something that might otherwise have been missed, tells a story, and above all, captures a very human moment. I’ll show you how to approach and photograph people without having to be confrontational or have the courage of a lion. We use the rich hunting ground of Tokyo as our stage, and a variety of equipment from compacts to medium format. Plenty of testimonials for past videos here at the bottom of the teaching store page. Almost all of those are in the video – either HTS2 or Street 1. Hello Ming! I just noticed in the “How to see – Tokyo” video that you have purchased the tiny Lumix G Vario 12-32mm. Any plans on writing a review on it, or at least share some comments? Thanks and it was a pleasure to see such a rich city through your eyes! Thanks for the feedback and compliments – glad you found it useful! Just finished watching – How to See EP2: Tokyo. The information is enjoyable and extremely helpful. The episode covers a large number and variety of scenes. I really enjoyed the locations selected. In particular the visits to gardens and landscapes was very illustrative and the photos wonderful. Also the street and building photography. Can’t wait to get out and shoot and apply these things locally. If I get to Tokyo I will have a huge list of sites to visit. Thanks Eric – glad you enjoyed the video! Hi MT, i am keen to sign up your email school of photography. Please kindly reply if it is available. Thanks. The next slot will be available in the second half of January. Would you like me to reserve it for you? If so, please send me an email…thanks! Glad you said that actually, halfway through Ep2 and I haven’t even got out of bed yet! Absolutely loving it; thanks Ming. Ep2: Fantastic. Not only hugely educational, but a joy to watch. Hmm, did we crash your server? S1 downloaded fine, and the server went down in the middle of H2 for me. Nope, everything shows normal here for all servers (we have a network around the world to keep things fast) – perhaps just give it another try and let me know if the issues still persist? Ming, I think that I survived this day when everything is shut down and called Christmas over here. Keep posting, your thoughts always stir me to try something new. Haha, thanks Ron. I was told by several retailers here that Christmas and New Year are actually the best sales days of the year for them – everybody is on leave! I am on boredom lockdown. The skies here in Texas are usually beautiful. It has been weeks now of either total white or total blue. The blue days are colder, that is how I can tell them from the white days. 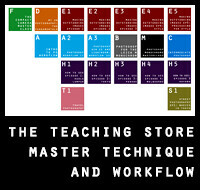 Ming, ordered already, was wondering if possible to have your roadmap to choose at the store? ?